Back at the hotel, we packed everyone in my car and left about 9:30 am with the intention of making a stop for provisions. We played the second day at the Sunridge Golf Club. Rather than playing your own ball, it was a shamble; you play the best drive and then your own ball from there. One of the highlights of the day had to be Gainsley's pants! Teeing off at 11 am with a shotgun start from hole #2, we played with the same foursome as the first day [Larkin, Gainsley and Mike Roessler]. 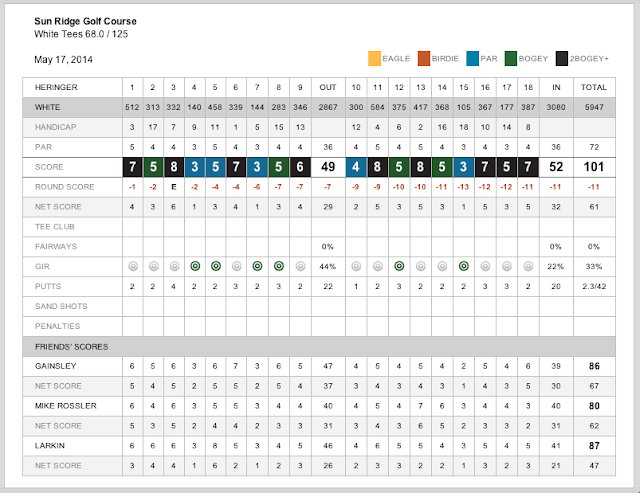 I continued to struggle with my putting, but started to drive the ball well on the back nine. I think that we may have used 5 or 6 of my drives on the back nine. I ended up with a liberal winter rules 101. After everyone was finished, there was a closest to the pin contest on the 19th hole. I am not sure who won. Heading back to the hotel, we stopped at Best Buy so I could get a phone charger. Getting cleaned up, there was a group prime rib dinner at Red's Old 395 Grill. The restaurant put the group in a large room where they could close the doors. I played Blackjack for about an hour and a half after dinner with a couple of the younger guys in the group (Rod's nephew et al). Putting down $100, I walked away with $149.50. I was very pleased. I finished the night watching SNL and listening to Larkin snore.